.Mr. 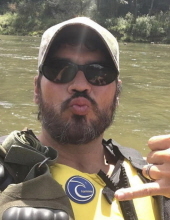 Eric Eugene Skerbinc, age 47 of Wilkesboro, passed away Wednesday, December 5, 2018 at Wake Forest Baptist Medical Center in Winston Salem. Memorial services will be held 1:00 Pm Saturday, December 8, 2018 at Reins Sturdivant Chapel with Roy Mallory officiating. The family will receive friends from 11:30 until 12:30 prior to the service at Reins Sturdivant Funeral Home. Mr. Skerbinc was born March 7, 1971 in Iowa to Joseph Eugene and Sheryl Loydene Landgrebe Skerbinc. He was a veteran of the United States Army. While serving his country, he obtained the rank of SPC-E4, was in the 1st Infantry Division at Fort Riley; 119th Infantry Division Brigade in Henderson NC and was awarded Soldier of the year for 119th. He was and avid outdoorsman; loved to shoot firearms; loved building Military Models; Proprietor of North Face Tavern; loved Appalachian State Football, Alabama Football and the Atlanta Braves Baseball Team. Most of all he was a loving father and spouse. He is survived by his wife; Andrea Denise Skerbinc of Wilkesboro, his parents; Joseph Eugene and Sheryl Loydene Skerbinc of Demopolis Alabama, a daughter; Ashlynn Skerbinc of Charlotte, two sons; Matthew Baker of Boomer and Taylor Skerbinc of Boone, a sister; Jessica Cooper of Alabama and a brother; Jason Skerbinc of Alabama. The family requests no flowers or memorials. To send flowers or a remembrance gift to the family of Eric Eugene Skerbinc, please visit our Tribute Store. "Email Address" would like to share the life celebration of Eric Eugene Skerbinc. Click on the "link" to go to share a favorite memory or leave a condolence message for the family.